The advanced printing options in the ActiveReports Viewer, allow you to change page scaling, set page margins and add a watermark when printing a report. In the Viewer toolbar, click the Print button. See Windows Forms Viewer for information on the Viewer toolbar. In the Print dialog that appears, click Advanced. In the Page Setup dialog that appears, go to the Layout and Watermark tabs to set page scaling, page margins and watermark options. In the Page Setup dialog, on the Layout tab under the Page Handling group, select a value from the Page Scaling drop-down list. 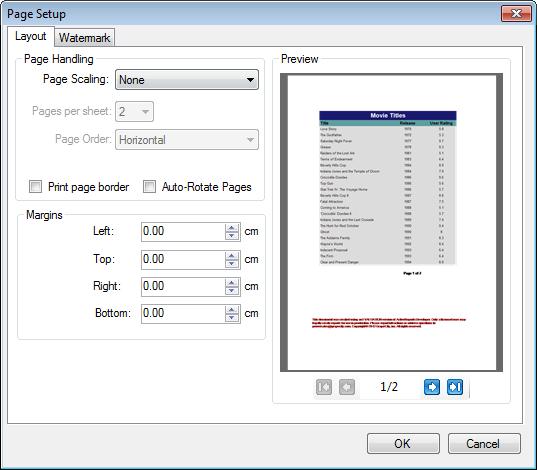 In case you select Multiple pages per sheet under Page Scaling, you can specify the Pages per sheet and Page Order options. Note: You may also check the Print page border or Auto-Rotate Pages check box for further customization of your print setup. In the Page Setup dialog, on the Layout tab under the Margins group, enter values for the Left, Top, Right and Bottom margins. In the Page Setup dialog, on the Watermark tab, under the textbox named Text, enter the text you want to display in your watermark. Select the Font, Size, and Color for the text. In the Angle field, enter a numeric value between 0 and 360 (A value of 0 renders straight left-to-right text. A value of 180 renders inverted text).